Corals that inhabit the colder deep waters of continental shelves and offshore canyons, ranging from 50 to over 1000m depths. They lack zooxanthellae and may build reef-like structures or occur solitarily. Cold-water corals are different from their warm-water counterparts because they do not contain symbiotic algae for photosynthesis and grow more slowly. Cold-water corals obtain all their energy from organic matter and zooplankton, which they catch from the currents drifting past 2. These communities can create a heterogeneous structural biogenic habitat which can take on a diverse range of forms, of varying density and reaching heights of several metres above the seabed 2, 3. The principal ecological aspects of cold-water corals are only beginning to be understood as the technology to explore deep-water environments has advanced significantly in the last decade. Cold-water corals can be found over a wide range of latitudes, from tropical to polar regions, and from the shallow to the deep seas. Their distribution is largely defined by water temperatures, which must generally be between 4° and 12°C. At high latitudes, these conditions are generally found in relatively shallow waters (approximately 50 to 1,000m), and at low latitudes they are present at great depths (up to 4km), beneath warm water masses 1. Compensating for knowledge gaps posed by the relative inaccessibility of cold-water corals, substantial progress in mapping cold-water coral distribution has been achieved through the use of species distribution models 4, 5, 6. Despite suffering from a lack of observed information on both distribution and diversity, cold-water corals are arguably one of the most three-dimensionally complex habitats in the deep sea. Cold-water corals can occur as isolated colonies (i.e. small patches of free-living individuals), or they can form large reefs covering up to several kilometres, or even massive carbonate mounds up to 300m in height 1. Although octocorals are not reef-forming, they can form complex single- or multi-species assemblages, particularly in combination with the other three groups of cold-water corals. They are certainly unique ecosystems in terms of being ‘ecosystem engineers’ that provide habitat structure (e.g. feeding and nursery grounds) for other organisms, including specialist fauna, in the deep ocean 7, 8. Ecosystem engineers play key roles in ecosystem organisation by providing conditions or resources essential for species to complete their life cycles or by helping to maintain niche diversity such as by providing complex habitat structures 9. For instance, up to 1,300 associated species have been found living on Lophelia pertusa reefs 1, and cold-water coral reefs may also be associated with a distinctive fauna 10. Like their warm-water counterparts, deep-sea coral communities support a large number of other marine species, such as bristle worms, crustaceans, molluscs, starfish, sea urchins and fish. 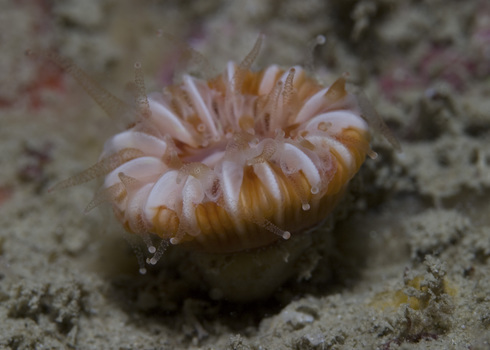 It has been suggested that cold-water coral biodiversity may be comparable to that found on warm-water coral reefs although, for practical reasons associated with the difficulty in sampling deep sea areas, few quantitative studies of ecosystem function and regional comparisons have been possible 1. It is likely that many species unknown to science will be discovered in years to come. While unlike coral reefs it is unlikely that many people will see cold-water corals first hand, there is interest in their existence based on the popularity of programmes about the marine environment that provide evidence of the appeal of this ecosystem 11. The ability of cold-water corals to provide heterogeneous structure which supports other species has considerable value in terms of their place in the wider ocean habitat. Their provision of habitat niches for commercially fished species is also of high importance 12. Cold-water corals are fragile and extremely slow-growing (with some reefs being tens of thousands of years old), making them particularly vulnerable to disturbance and environmental change, for instance deep-water trawling and ocean acidification 1. Despite the depth at which these ecosystems are found, there is significant evidence of human activities in the majority of surveys which have been undertaken 2. Bottom fisheries are one of the greatest threats to this habitat because of heavy gear may cause hundreds of years worth of damage when it comes into contact with the slow-growing reefs 2. Other threats include oil and gas extraction, cable and pipeline placement and mineral exploration. In addition to direct damage and clogging with silt from fisheries activities, ocean acidification is a problem. Ocean acidification is caused by increased concentrations of carbon dioxide in the Earth’s atmosphere 13. Changes in carbon dioxide concentration and that of other gasses in the Earth’s atmosphere lead to changes in chemistry of the ocean through air-sea gas exchange 14. These changes result in elevated acidity in the ocean, which is a direct threat to corals as it can lead to corals being dissolved by the water around them 15. Finally, slowed growth and increased fragility are also consequences of ocean acidification 14. The vulnerability of these slow-growing delicate structures, combined with the high levels of biodiversity they may promote, make them an important focus for marine conservation. Cold-water coral species, however, have not yet been assessed under the IUCN Red List of Threatened Species 16. Also, there is limited information on the biodiversity levels associated with cold-water coral reefs, though it is likely elevated relative to the surrounding habitat. Roberts, J. M., Wheeler, A. J. & Freiwald, A. Reefs of the deep: the biology and geology of cold-water coral ecosystems [Review]. Science. 312, 543–547 (2006). Freiwald, A., Fosså, J. H., Grehan, A., Koslow, T. & Roberts, J. M. Cold-water coral reefs. UNEP-WCMC, Cambridge, UK. (2004). Stone, R. Coral habitat in the Aleutian Islands of Alaska: depth distribution, fine-scale species associations, and fisheries interactions. Coral reefs 25, 229–238 (2006). Davies, A. J. & Guinotte, J. M. Global habitat suitability for framework-forming cold-water corals. PLoS One 6, e18483 (2011). Roberts, J. M., Freiwald, A. & S. Cairns. Cold water corals: the biology and geology of deep-sea coral habitats. 352 (Cambridge University Press, 2009). Fosså, J. H., Mortensen, P. B. & Furevik, D. M. The deep-water coral Lophelia pertusa in Norwegian waters : distribution and fishery impacts. Hydrobiologia 471, 1–12 (2002). Keith, D. a et al. Scientific foundations for an IUCN Red List of ecosystems. PLoS One 8, e62111 (2013). Henry, L. & Roberts, J. Biodiversity and ecological composition of macrobenthos on cold-water coral mounds and adjacent off-mound habitat in the bathyal Porcupine Seabight, NE Atlantic. Deep Sea Res. Part I Oceanogr. Res. Pap. 54, 654–672 (2007). Beaumont, N. J. et al. Identification, definition and quantification of goods and services provided by marine biodiversity: Implications for the ecosystem approach. Mar. Pollut. Bull. 54, 253–265 (2007). UNEP. Global Environment Outlook (GEO 4) (eds. Mcneely, J. A. & Camara, J. B. D.) 163–192 (United Nations Environment Programme (UNEP), 2007). Cooley, S. R., Kite-Powell, H. L. & Doney, S. C. Ocean acidification’s potential to alter Global Marine ecosystem Services. Oceanography 22, 948–952 (2006). Guinotte, J. M. & Fabry, V. J. Ocean acidification and its potential effects on marine ecosystems. Ann. N. Y. Acad. Sci. 1134, 320–342 (2008). Turley, C., Roberts, J. & Guinotte, J. Corals in deep-water: will the unseen hand of ocean acidification destroy cold-water ecosystems? Coral reefs 26, 445–448 (2007).